The title of this selection suggests that it would most likely be found in which of these books? From whose point of view is the story told in this poem? Which question does stanza 3 answer? What did Sue look like? Was Bill able to lasso a tornado? Did Bill get Sue her own horse? What is the rhyme pattern for each stanza? How did Slewfoot-Sue change in the last stanza from stanza 3? She never saw Pecos Bill again. She didn’t ride horses anymore. She learned to rope and shoot. Which phrase from the poem tells something that Sue and Bill did together?
. . . roped the storm . . .
. . . kept a-bouncin’ up and down . . .
. . . rode upon the wind . . .
. . flew around the moon . . . Which question does paragraph 5 answer? What quality of vision do birds possess? What types of feathers do birds have? What is meant by the term “lift”? 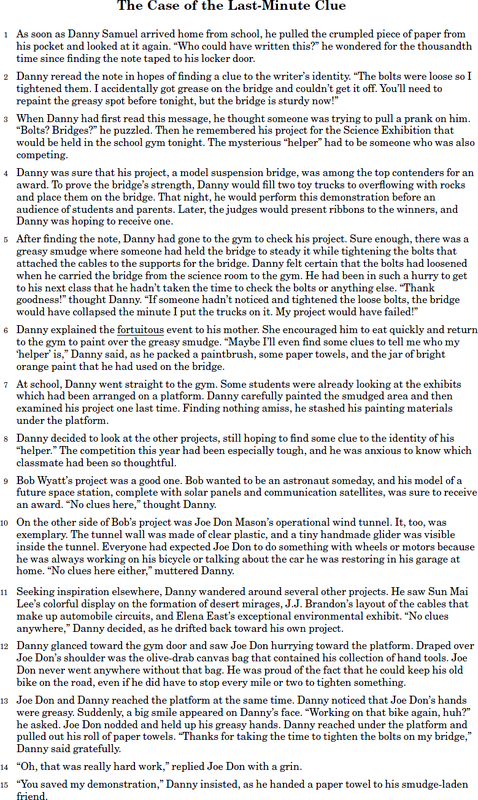 Which sentence expresses the main idea of the article? Birds are uniquely crafted to fly. Airplane propellers remind an observer of a bird’s wings. The beaks of birds may break easily. Which is the best summary for this selection? 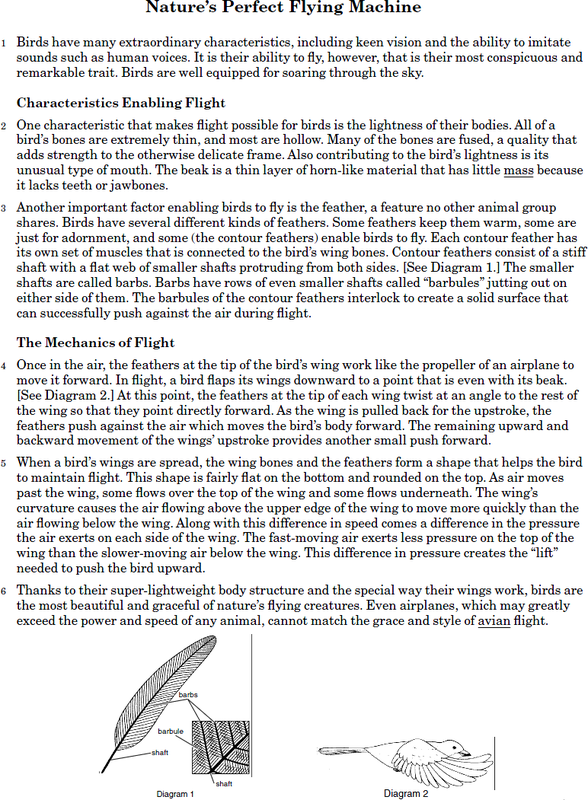 A bird’s light body and feathers make it well suited for flight, and its wings move in a special way in the air. When a bird’s wings are spread, its wings and feathers form a special shape that helps the bird to maintain flight. The upward and backward movement of the wing during upstroke helps to push a bird forward as it flies. The ability of a bird to fly makes it more interesting to read about than any other kind of animal. Which of the author’s opinions is best supported by the facts in this selection? Even airplanes can’t match the grace of birds in flight. Birds are the most beautiful of nature’s flying creatures. Birds are well equipped for soaring through the sky. Flight is the most noteworthy trait of birds. Which form of literature is this selection? Which point of view does the author use in this selection? What is the initiating event in this selection? Why is it important to the plot of the selection that Luisa lives in an apartment building? She does not have a garden of her own. It is very far away from Isabel’s house. She is unable to grow plants in her room. Her family must live in a very small space. 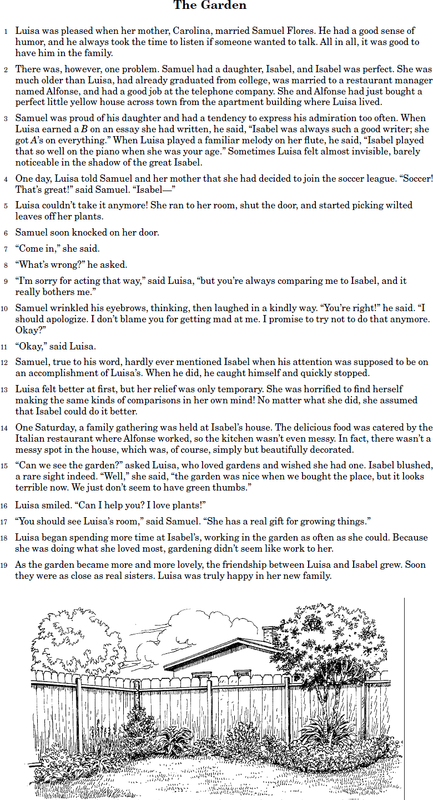 What does the author mean by the sentence in paragraph 15, “We just don’t seem to have green thumbs”? We prefer to use dried flower arrangements. We don’t have a very large garden. We have worked very hard to grow vegetables. We are not very good at growing things. What is Luisa’s internal conflict? She can never live up to Isabel’s reputation. She has wished for a sister for many years. She is sad because she does not have a garden. She must work hard to control her temper. How did Luisa change over the course of the selection? She became more confident in her own strengths and abilities. She realized that she would never become friends with Isabel. She decided to participate in more sports activities. She helped convince her mother to marry Samuel. Information in which paragraph of the letter supports the idea that Wes Woodrow is practical with his own money? 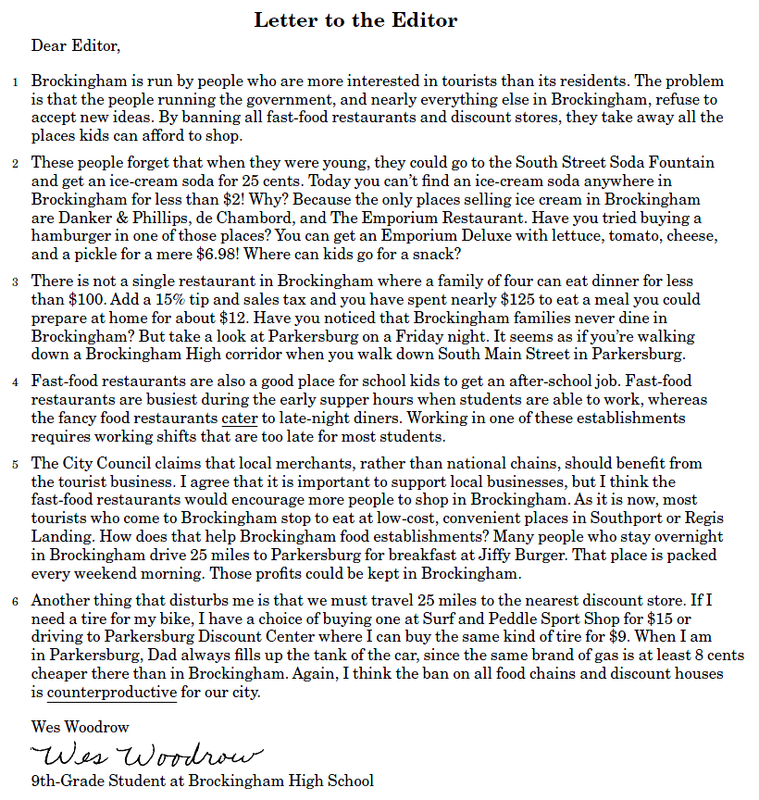 Which statement from the letter best supports the idea that Wes Woodrow’s family has probably lived in Brockingham for a long time? Another thing that disturbs me is that we must travel 25 miles to the nearest discount store. These people forget that when they were young, they could go to the South Street Soda Fountain and get an ice-cream soda for 25 cents. The problem is that the people running the government, and nearly everything else in Brockingham, refuse to accept new ideas. You can get an Emporium Deluxe with lettuce, tomato, cheese, and a pickle for a mere $6.98! Which is an opinion expressed in the letter? It seems as if you’re walking down a Brockingham High corridor when you walk down South Main Street in Parkersburg. Most of these places have shifts that accommodate a student’s schedule. Today you can’t find an ice-cream soda anywhere in Brockingham for less than $2. When we are in Parkersburg, my dad always fills up the tank of the car.